This vegan chickpea vegetable chowder is satisfying and delicious. 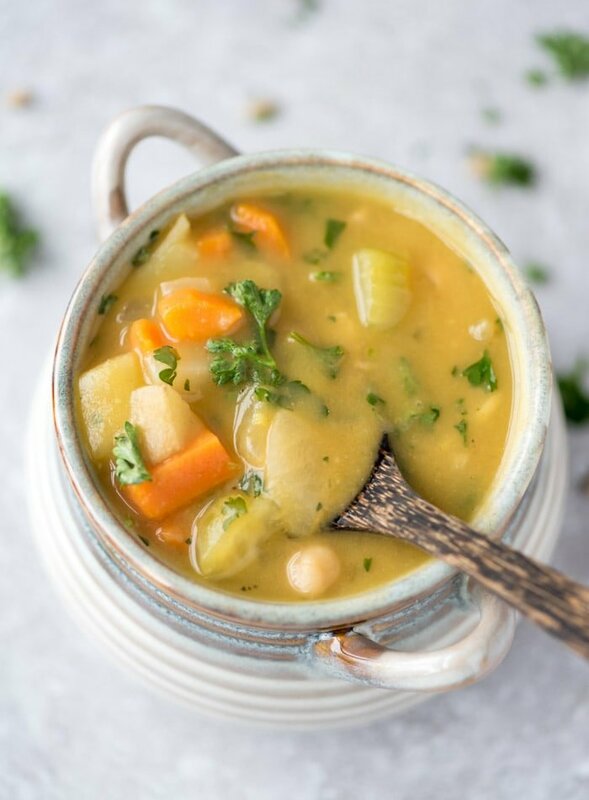 It’s made with chickpeas, potatoes and carrot for a bit of a twist on classic vegetable chowder. Blend half the soup for a thick and chunky, hearty soup you’ll want to eat all winter long. This soup is low in fat, gluten-free, oil-free, sugar-free, inexpensive to make and ready in under 30 minutes with basic, everyday ingredients. Chickpeas, or garbanzo beans, are loaded with protein, iron, zinc, fiber, folate and potassium, making them gram for gram, one very nutritious food. In 2007, the America Institute for Cancer Research published one of the most comprehensives studies on cancer and diet ever done. Their findings resulted in a cancer-prevention recommendation to eat legumes not only on a daily but at every meal! This includes beans (including soybeans), chickpeas, lentils and split peas. Eating beans at lunch and dinner is easy but what about breakfast? Well, it’s actually very easy too if you get a little creative! How about adding some mashed cannellini beans to your oatmeal, or some black beans to a chocolate smoothie, or trying my chickpea breakfast cookies or sweet potato breakfast bowls? Then there’s always the classic beans on toast, which you can make a little more interesting by adding mashed avocado. Tempeh, or fermented soybean, is really nice at breakfast too, you can dry-fry it in a pan until crispy. As for snacks, roasted chickpeas, edamame, hummus and black bean dip all make it easy to include a serving of beans in your day. Shell peas also make a great snack just on their own. Try them in the late spring when they’re in season and at their peak of deliciousness. 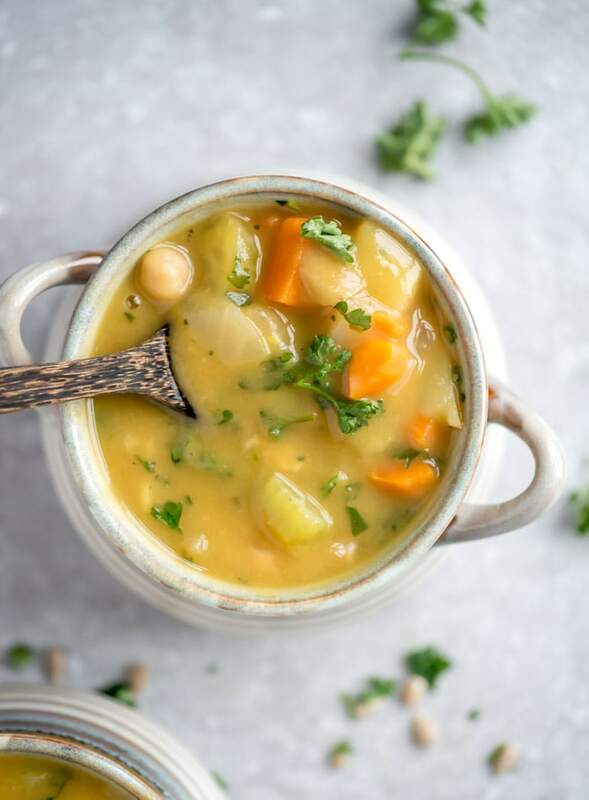 This chickpea vegetable chowder is really easy to make and is great for the end of the week when you might need to clean out the fridge and want to keep things simple and comforting. It takes under 30 minutes to make from start to finish and it keeps well so it can be made in advance and enjoyed for up to 5 days. 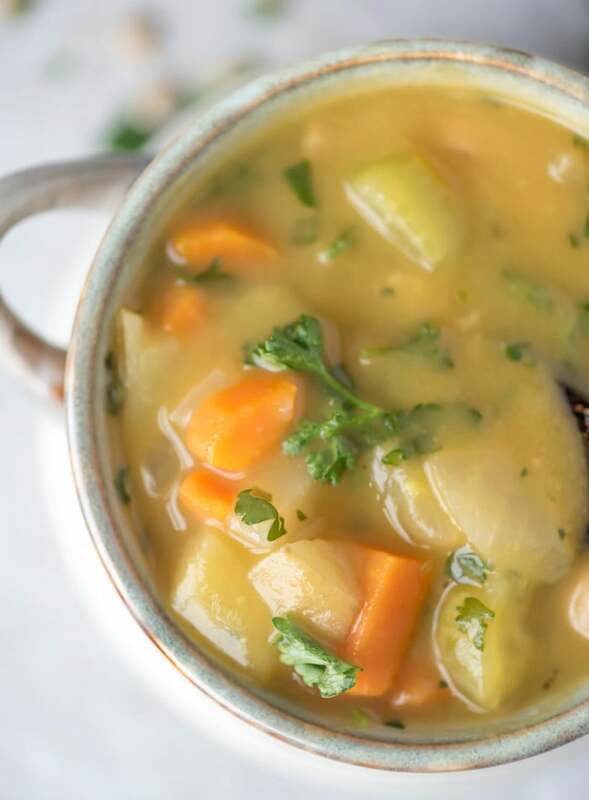 It’s made with plenty of nutritious but inexpensive vegetables such as onion, garlic, celery carrots and potatoes making it a good immunity-boosting soup to enjoy throughout the winter. I’d recommend using a yellow-fleshed potato such as Yukon gold but you can also use russet potato. I blended about 1/2 of the soup to give it that creamy chowder consistency but leave plenty of chunky vegetables in every bite. Let it blend for a while for an ultra-creamy, chowder base for the chunky veggies left behind. I used my Vitamix which resulted in a beautifully smooth soup but any blender works fine, you might just need to let it blend a little longer. This hearty soup is a take on classic vegetable chowder. 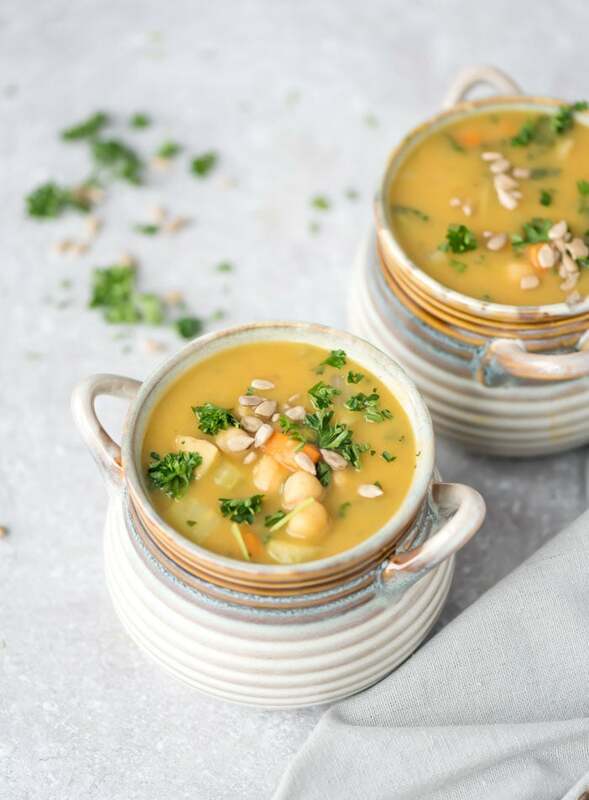 It’s made with a base of chickpeas, carrot and yellow potato for a hearty and satisfying soup that’s full of protein, fibre, vitamins and minerals. This soup is vegan, gluten-free, oil-free and sugar-free. Cook the onions, garlic and celery in a soup pot with 1/4 cup of the vegetable broth for about 5 minutes. Add more broth if needed so it’s doesn’t stick. Add the oregano and thyme, stir and cook for 1 more minute. Add the rest of the ingredients except for the parsley and simmer for 15-20 minutes until the potatoes and carrots are tender. Transfer about 1/2 of the soup to a blender and puree until smooth and creamy. Stir in the parsley and serve right away. Any leftovers can be stored in the fridge for up to 5 days or in the freezer for up to 3 months. You know what I love about your blog (among many things)? I love how you have that little “jump to recipe” button. Keep up the good work, and I’m off to make a couple soups now. Glad you liked it! Thanks for your comment. Just made this!! so good and simple! This is so so delicious – it is perfect for a cold January day! Also, I absolutely loooove what you’ve served it in. Thanks Freya! So happy you liked it! If found these little bowls at HomeSense, I love them! Not only is this easy to make but it’s delicious! I’ll be making more of it. Love it! My son with food allergies loves this soup! So does the rest of my family! Awesome recipe! Thank you! Amazing. So happy you guys enjoy it! Loved it. I didn’t puree it. Just lightly used a potato masher to loosen the starches in the potatoes which made it thick enough for me. Awesome. Glad you enjoyed it, JoAnn! Recipe is great! So easy and so tasty! But you’ve got to tell us where to get the soup crocks in the photos. I rarely get the gotta-have-its as bad as I have for these. haha, I got them at HomeSense actually! Just a few dollars each! Glad you liked the recipe. Making this right now…so excited! What is the measurement in cups for a serving size? I’m not sure how much a serving is in cups. It’s 400 grams per serving if you have a kitchen scale. I’d say roughhhly 2-3 cups?? It makes 5 servings in total, so I guess you could divide it into 5 containers to see how much one serving is, a bit messy but then you would know! That’s awesome, Megan. So glad you guys liked and your husband approved!! haha. Thanks for the comment!! I appreciate it. Excellent soup. Made it and the whole family loved it. Glad to hear it, Steve! Thank you for this recipe – it was excellent! I made Julia Child’s French baguettes to go with it and it all fed 4 hungry adults. Super easy to make and especially awesome because I just pulled out my pre-chopped veggies from the freezer and threw in the pot. Awesome! That’s awesome, Kori! So happy to hear that. Sounds amazing with homemade baguettes! So good! My husband and I love all kinds of soups all year long, but the real shocker here is my veggie-adverse 3-year-old ate this up eagerly. He usually picks the celery out but ate all of it this time. I think he liked that this soup was less chunky than I usually make, because of the blending. Thanks! Haha, that’s awesome that your 3 year old loved it! It’s definitely a crowd-pleaser, so easy too! Excellent recipe! I made it exactly as is and it was perfect. Thanks for a great recipe! You’re so welcome. I’m glad you enjoyed it. Tried this soup and it turned out amazing! The ingredients are so simple as well. I do have to ask where did you get those soup bowls? I got them at HomeSense actually! They were just a few dollars each! 🙂 So glad you enjoyed the soup. Would this soup freeze ok? Yep, should be fine for freezing in an air-tight freezer safe container up to 3 months. Have made this twice. Hearty and good comfort food. Low Cal and Low Carb. It is delicious!!! Oh, that’s so awesome. So glad you like it! You can just leave them out or replace them with sweet potato, extra potato and celery or some squash. Enjoy! One of my favorite soups.Have you tried this in a crockpot? I love using mine, assuming you could throw everything in after cooking the onions and celery? Ya, I think that would be fine. I haven’t tried it but let me know if you do! This looks and “reads” delicious but garlic in any form makes me ill. (The same with scallions.) Any suggestions re: what could replace the 4 cloves of garlic? You can just leave it out. No problem. Use a good, flavorful broth and it will still be delicious. How is it with white sweat potato’s? Would it ruin the flavor and taste? Did you drain them first and then measure? Once you drain and rinse a 19 oz can of chickpeas it comes out to about 2 cups at roughly 165 grams per cup. I’ll clarify in the recipe, sorry about that! If you only used a 14 oz can, the recipe would still work, it might be slightly less thick but would still be good! I hope you were still able to make the recipe and enjoy it. It’s a yummy one! Thanks for the feedback there.